Home > Our Blogs > Facing Today > What Can We Learn From the Memphis Sanitation Strike 50 Years Later? It was while preparing to launch this campaign that Dr. King was asked to come to Memphis to support the strike, which began when two of the city’s black sanitation workers were crushed to death on February 1. Dr. King will forever be connected to the sanitation strike of 1968 but it is also important to acknowledge that movements are rarely embodied in any one individual. Instead, it is often the collective vision of many. What Makes A Movement Effective? It is hard to know to what extent Dr. King’s presence and assassination impacted the outcome of the strike, yet there were several universal characteristics that helped the movement succeed. Effective movements require courage and sacrifice. This was certainly true of the sanitation workers strike. Those on strike faced economic hardship—both in terms of loss of wages and the very real possibility of retribution for organizing and striking. The workers also faced sharp public ridicule from some—not the least of which came from some of the major local media outlets. Finally, there was the threat of violence and excessive force during their demonstrations. Other hallmarks of effective movements are compromise and collaboration. The sanitation workers strike came at a time when the broader Civil Rights Movement was considering different visions on how to bring about social change. 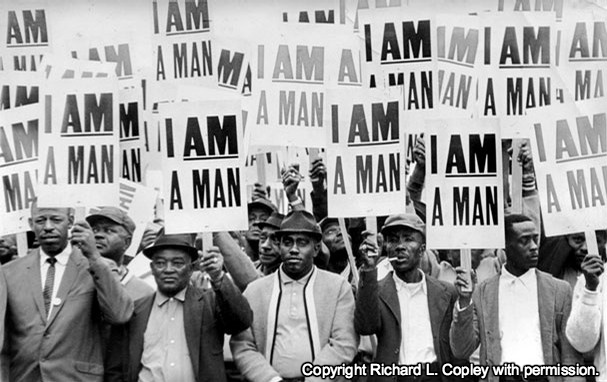 Elements of direct nonviolent action, black nationalism, and black power were present in Memphis in 1968. These various elements often had to work toward compromise and collaboration rather than absolutism and competition. This principle of compromise and collaboration is also often present with a movement’s relationship with its allies. This was certainly the case with the sanitation workers strike. The presence and support of the union leaders strengthened the workers’ cause. However, the union leadership was also criticized by some for being overly paternalistic and opportunistic in its approach. In simplified terms, the movement was meant to bring about progress. But, what does “progress” mean? Certainly, it meant better wages and better working conditions in the moment, but how have we progressed as a society since 1968? What work remains to be done? Progress is rarely a straight, ascending line. Instead, it often contains advancements and setbacks along the way. As such, personal and collective commitment emerged as a requirement of effective movements. That’s the definition of commitment—patience and persistence. People who are like fireworks, popping off right and left with lots of sound and sizzle, can capture a crowd, capture a lot of attention for a time, but I always have to ask, where will they be at the end? Some battles are long and hard, and you have to have staying power. Firecrackers go off in a flash, then leave nothing but ashes. I prefer a pilot light—the flame is nothing flashy, but once it is lit, it doesn’t go out. It burns steadily, and burns forever. It’s important for us to reflect upon our own civic responsibility in this current context. And we need to help our students think about these themes of courage, compromise, collaboration, and commitment, because in the end, they’ll be carrying the torch of progress for us. Explore the role of civic engagement in a healthy democracy through the lens of Dr. King’s legacy with our new resource collection, Memphis 1968. You can examine the strategies of Dr. King, Malcolm X, and Stokely Carmichael; dive deeper into the sanitation workers strike; and analyze Dr. King’s final speech while considering how you can create a more just world with your students.